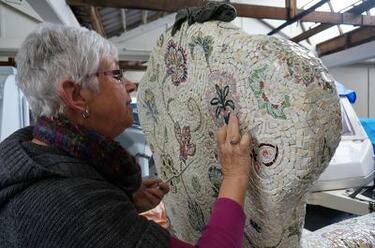 A photograph of members of Crack'd for Christchurch using pieces of broken china to create a mosaic on their ottoman. 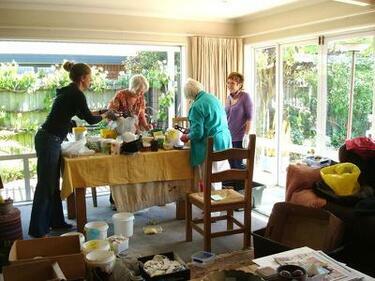 Crack'd for Christchurch comments, "A mosaicking day over summer...lots of laughter and good food too." 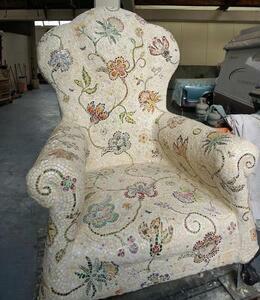 A photograph of Crack'd for Christchurch's partially-completed mosaic on their armchair. 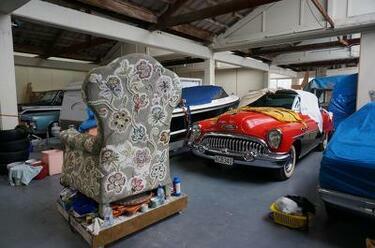 Crack'd for Christchurch comments, "We could see the chair was beginning to look good." 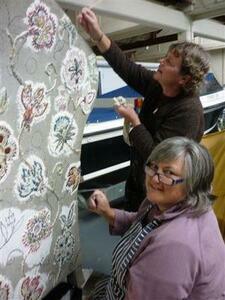 A photograph of Helen Campbell and Jennie Cooper working on Crack'd for Christchurch's armchair mosaic. 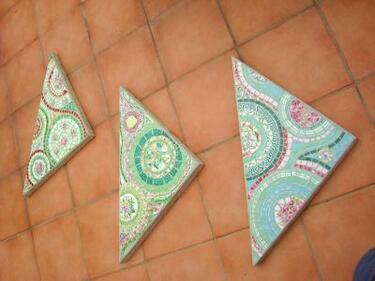 A photograph of three mosaic pavers sitting on a tiled floor. Crack'd for Christchurch comments, "As a trial we made pavers for the temporary Bus Exchange on St Asaph Street." 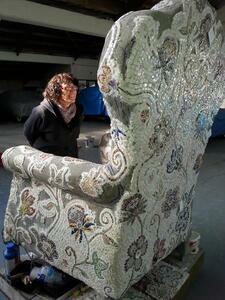 A photograph of Jenny Cooper examining Crack'd for Christchurch's almost-completed armchair mosaic. Crack'd for Christchurch comments, "The best part of every mosaicking day was when we had tidied up and could enjoy our work." 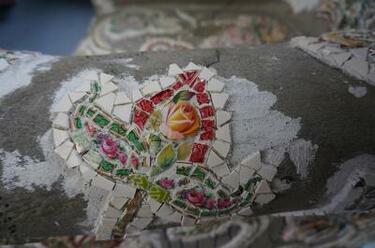 A photograph of the almost-completed mosaic on Crack'd for Christchurch's ottoman. Crack'd for Christchurch comments, "Otto mosaicked but not grouted." 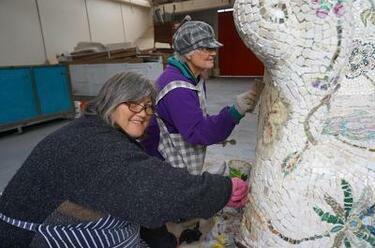 A photograph of Katherine O'Connor and Helen Campbell adding grout to Crack'd for Christchurch's armchair mosaic. 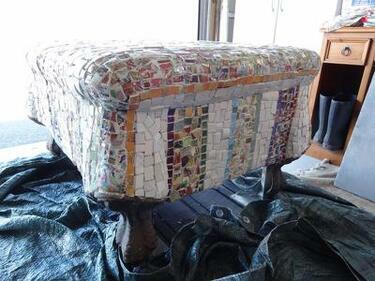 Crack'd for Christchurch comments, "The very first grout goes on and suddenly the chair comes alive." 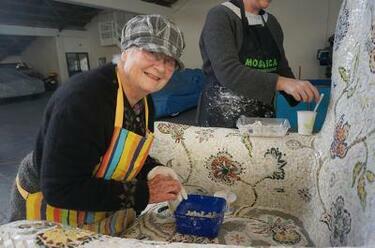 A photograph of Kathryn Innes working on Crack'd for Christchurch's armchair mosaic. 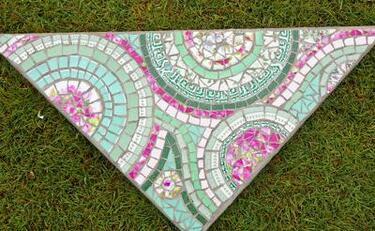 Crack'd for Christchurch comments, "Finishing edges and fine details before grouting." 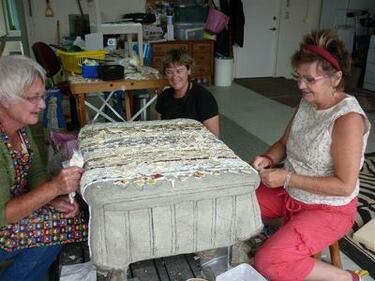 A photograph of members of Crack'd for Christchurch working on their armchair artwork. Crack'd for Christchurch comments, "Most of the pattern is in place, and the opus is slowly being put around each flower. From top: Jennie Cooper and Katherine O'Connor." A photograph of a paver sitting on a lawn. 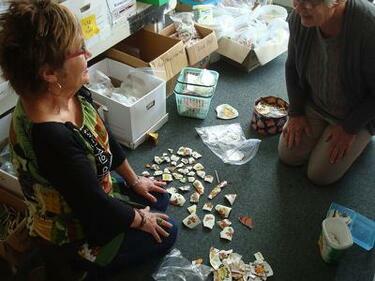 A photograph of Sharon Wilson and Helen Campbell working in Crack'd for Christchurch's workshop. Wilson and Campbell have laid pieces of broken china on the carpet in front of them. 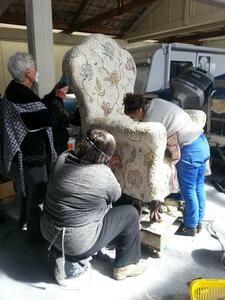 A photograph of members of Crack'd for Christchurch cleaning their armchair mosaic. Crack'd for Christchurch comments, "Once the grout was complete, the whole chair had to be clean of excess grout, polished, and sealed. A dirty job done with dremmels and various scrapers. From left: Helen Campbell, Katherine O'Connor, and Sharon Wilson." 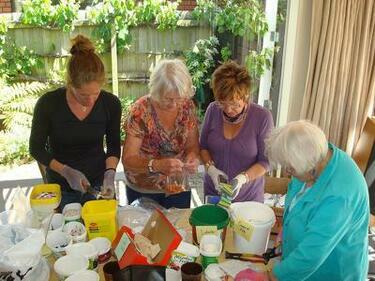 A photograph of members of Crack'd for Christchurch breaking up pieces of china. Crack'd for Christchurch comments, "November now, a nice shot of us (from left: Marie Hudson, Helen Campbell, Sharon Wilson, and Shirley Walden). We met regularly over that first winter, trying to keep on top of the china as it flowed in." 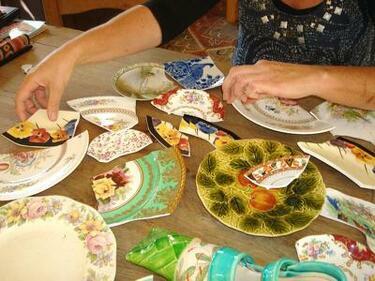 A photograph of a member of Crack'd for Christchurch laying out pieces of broken china on a table. Crack'd for Christchurch comments, "Some of our earliest donations." 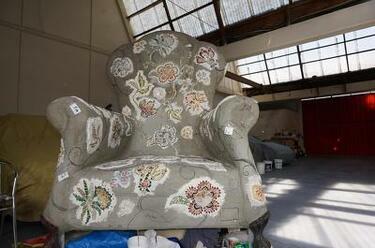 A photograph of Crack'd for Christchurch's finished armchair mosaic. 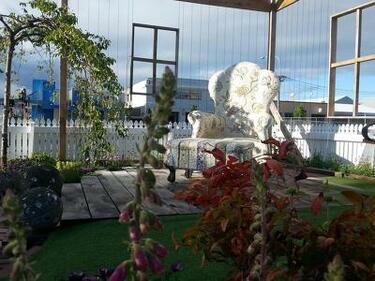 Crack'd for Christchurch comments, "Mid September 2014, 5 days before the launch. Flora ready to go and meet Otto." Crack'd for Christchurch comments, "Slow progress. Sometimes we thought we'd never get her finished. We were all battling our own earthquake consequences: losing homes and jobs, battling with insurers, illnesses and repairs. It was a long winter. But the conversation, food, laughter, and company were wonderful. An unforgettable experience." Crack'd for Christchurch comments, "November now, a nice shot of us (from left: Marie Hudson, Helen Campbell, Shirley Walden, and Sharon Wilson). We met regularly over that first winter, trying to keep on top of the china as it flowed in."